Jacobi, consummate Shakespearean that he is, plays Shakespeare’s insightful depiction of a mentally unstable man, one who not only trips from a state of clarity to a state of insanity and back again in the flash of a moment, but one who yet knows that this is happening to him. Produced by Cedric Messina; directed by Rodney Bennett. Derek Jacobi, Patrick Stewart, Claire Bloom, Eric Porter. When Kenneth Branagh was filming his 1996 Hamlet, the actor playing Claudius staged an impromptu ceremony, handing Branagh a small red-bound copy of the play. It was a tradition, begun with Johnston Forbes-Robertson who played Hamlet in the late 19th century, that each recipient would pass the book on to the greatest Hamlet of the next generation. Thus, that tag was passed on to Branagh, the Hamlet of the 1990s, from Derek Jacobi, the great Hamlet of the 1970s. 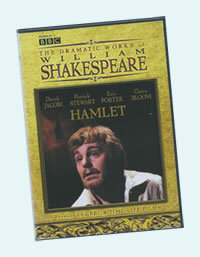 Although Jacobi’s Hamlet played out in a 1977 Prospect Theatre Company production with long runs in London and a two-year world tour, we get at least a taste of that performance with the BBC/Time-Life version of the play, part of the BBC’s ambitious project to telecast full-length versions of every entry in the Shakespeare canon. Upon its release in 1980, this became my benchmark Hamlet for personal reasons as much as artistic. My parents had seen the Prospect Hamlet in London and joined the chorus of Jacobi adulation. Patrick Stewart plays Claudius (the part Jacobi would later play to Branagh's Hamlet), and I had already seen him on the Royal Shakespeare Company stages as Oberon and as an Enobarbus who stole the show from Alan Howard’s Antony and Glenda Jackson’s Cleopatra. Finally, as part of a Shakespeare course at the University of Missouri, I got a sneak peak of the film when producer Cedric Messina visited our class. Notably, Messina said Jacobi’s Hamlet in the BBC version was different from his Prospect version, though the actor brought a deep understanding of the role with him to the BBC set. It has now been about 20 years since I showed the BBC Hamlet to my kids. It was still my benchmark then, but having seen many more Hamlets since, including Branagh’s film, this week I revisited this great Hamlet of my youth. While the film has much to laud, especially in some of the performances, director Rodney Bennett’s work is clumsier than I remember, confoundingly amateurish even. At times the actors play on an allegorical stage, at times in a realistic set; Bennett couldn’t decide if he was doing a film of the play or filming a staged play. The special effects in the ghost scenes would have made Georges Méliès shake his head in disappointment. Hamlet and Horatio scurry for cover in the graveyard right in front of the royal funeral procession. An attempt at a dramatic change in long focus during the fencing scene results in an entirely blurred picture. Most confusing was Claire Bloom’s Gertrude staring right at, and reacting to, the ghost in the closet scene. At first we thought this might be interpretation of the lines, that she actually does see the ghost (this production makes some bold interpretations in other places). But, no, the way she speaks her subsequent lines and reacts to Hamlet insisting he sees his father suggests that Gertrude the character did not see the ghost though Bloom the actress very much did. Nor has the film worn as well over time as, say, the BBC’s Richard II. In Hamlet, Jacobi’s two-tone tights and codpiece are quite distracting, and his Bo Duke hair detracts from his stature as the great Dane. But, then, his is no great Dane in the context of the play. In the play’s last speech, Fortinbras (Ian Charleson) says of Hamlet that, “he was likely, had he been put on, to have proved most royally.” “I doubt that,” I replied, out loud. Jacobi’s Hamlet is very much a brat; smart as a whip, yes, but self-indulgent in his melancholy, and his irresoluteness is, obviously, a lack of courage. After the mousetrap, Claudius stands, calmly asks for light, and puts the torch up to Hamlet’s face. Hamlet covers his face with his hands, then peers back at Claudius and begins laughing, nervously at first and then maniacally. At that key moment, he simply is unable to stand up to the king. Claudius smirks: “Away!” he barks and departs. Question this interpretation of Hamlet’s character, if you will, but don’t question Jacobi’s playing of it. Whether this was near to his famous Prospect Hamlet or not, this BBC Hamlet is still as great a performance as you will ever see. The soliloquies, in particular, are pinnacle acting, with Jacobi addressing the camera directly. He has expertly considered every line of every speech, and so each speech is delivered with unequaled clarity of meaning and Jacobi’s unequaled talent in speaking verse. If for nothing else, this film is worth the purchase just so you can fully appreciate how great Hamlet’s soliloquies really are. It is also worth the viewing of Stewart's Claudius, such a nuanced performance I never fully appreciated before. Stewart hones in on one particular trait of Claudius: impatience. Claudius wants Polonius to talk of Hamlet’s madness before handling the state business with the ambassadors. Claudius decides to send Hamlet to England before finding out what is really driving the young prince in his bizarre behavior. Claudius wants a backup plan in Laertes’ plot to kill Hamlet, and then goes to that plan before the fencing contest gets to the agreed-to three hits. Claudius can’t even last two minutes at prayer before he gives up and moves on to another tact. This is the impatience of a man who would kill his brother and marry his sister-in-law rather than wait for the possibility of inheriting the crown and merely dallying with the queen. Commanding and efficient throughout, Stewart in his line readings reveals a Claudius contending with a degree of insecurity while seeking solutions as quickly as possible. Though Steward might seem to be giving a stiff performance, his tautness is that of a tense man stretched to the snapping point (Gertrude even pats him to patience in the opening court scene lest he rail too much at her son). Two other memorable performances are turned in by Jonathan Hyde as Rosencrantz and Eric Porter as Polonius. In contrast to the more humble and watchful Guildenstern played by Geoffrey Bateman, Hyde’s Rosencrantz is an oily sort and much the egotist. He really is a sponge soaking up the king’s attention, and he really doesn’t like being called one, either. When Hamlet suddenly and intentionally switches to the royal “we” with his supposed friends, Rosencrantz takes notable affront. “My lord, you once did love me,” he says haughtily more than hurt. As Hamlet talks of “this most excellent canopy, the air, look you, this brave o’erhanging firmament, this majestical roof fretted with golden fire”—all allegory, of course—look to the background where Rosencrantz has tilted his head back to stare up at the ceiling, a pose that says either he’s a fool or he’s affecting understanding, or both. Funny stuff. There’s funnier stuff between Hamlet and Polonius, but all of it is in the way Jacobi and Porter work their lines with each other. This Polonius starts out as a clear-headed counselor and father at the first, seeing right through Ophelia’s naiveté into the danger lying within the attraction she shares with the prince (a degree of class separation that plays as a subtext in this production through to Ophelia’s funeral). But he inexplicably turns buffoon by Act II and comes to relish being part of the king’s inner circle to the point he ends up not even offering Hamlet the simple courtesies of royalty. I’m willing to place the fault of this dichotomy of character on Shakespeare, for Porter’s performance is that of an assured craftsman expertly handling his lines, and he creates with Jacobi a comic team of superb timing along the order of Burns and Schreiber in the Polonius-Hamlet tête-à- têtes. The BBC series steadfastly kept shut the door on any conceptual interpretations of the plays; directors couldn’t even depart from period costumes in their productions. While this caters to the purists, this Hamlet nevertheless pushed the envelope with some interesting interpretations. When the king and queen first meet with Rosencrantz and Guildenstern in II.2, both know exactly who is who, a departure from the now-common practice of having Claudius mistakenly addressing one for the other. Instead, it is Hamlet who mixes up the identities of the two upon his line “How dost thou, Guildenstern? O, Rosencrantz!” The implication being that they were not as close friends as Claudius and Gertrude had believed, Hamlet immediately starts playing them like pipes. In the nunnery scene, upon speaking his first line to Ophelia, Hamlet takes the book from her hands and turns it around; she had been reading it upside down. He knows the game is on and, from that point, speaks his lines for the sake of the eavesdroppers rather than Ophelia. In his own soliloquy, Claudius lists “those effects for which I did the murder” and pauses before saying “my queen.” In Stewart’s reading, the one thing Claudius could never face is Gertrude learning the truth. When Claudius checks the arras behind which Polonius stood when Hamlet killed him, he comes away with Polonius’ blood literally on his hands. Horatio (in a suitably understated performance by Robert Swann) is not put off by the deaths of Rosencrantz and Guildenstern: instead, he suddenly sees the depth of the king’s treachery (he hadn’t totally bought into the mousetrap’s evidence as did Hamlet), and it is then that the two truly bond as friends. In this light, Hamlet's assurance earlier in the play that he is not merely flattering Horatio indicates an isolated Hamlet very much wanting a real friend and so turning to Horatio. So, was Hamlet mad or just mad in craft? This production’s conclusion: both. Clearly, Jacobi’s Hamlet has his wits about him when he interacts with Polonius, Rosencrantz, and Guildenstern, and when he locks horns with the king after Polonius' death. Nevertheless, he is truly frantic after meeting the ghost, he displays bipolar tendencies in the “what a rogue and peasant slave am I” soliloquy, and he is as out of control in the closet scene as Gertrude later describes him to be. This film’s most revealing moment comes in the nunnery scene when Jacobi’s Hamlet starts off craftily toying with Ophelia, but as he tries to leave her he keeps returning to heap more and more abuse on the poor girl in a spiraling cycle of temper. “Go to, I’ll no more on’t,” he yells at her, shaking her shoulders. The text has a stop there; various editors make it a comma, a colon, or a period. Jacobi makes it a period and then some, for he speaks his next line as a totally different man stunned into a sudden realization: “It hath made me mad,” he says quietly, looking beyond Ophelia, beyond everything. This Hamlet may be dated, but this Hamlet is ageless, a great portrayal in any generation. I was looking for opinions on Jacobi's Hamlet when I came across your article on Shakespeareances, and I just wanted to say how well you articulated exactly how I felt about Jacobi's performance. To me, his soliloquies perfectly encapsulate Hamlet's character, and Jacobi's readings of them are far and away my favorite versions. Just stunning. So again, thanks for the wonderful writing.